The purpose of this article is to demonstrate how to retrieve data from an Excel sheet and put it in a table in a SQL Server database. Anyone who's ever used a computer for a significant amount of time has probably come into contact with Excel, the spreadsheet application part of the Microsoft Office suite. Its main purposes are to perform calculations and create charts and pivot tables for analysis. But people have great imagination and invent new uses for it every day. I've even seen it used as a picture album. (Sorry dad, but I know you won't be reading this anyway. :-) ) Ever since he had this specific YACI, or "Yet Another Computer Issue", because his PC wasn't powerful enough to open his 45 MB Excel file, uh, "picture collection", he took some evening classes. He's now putting his Photoshopped pictures in PowerPoint... Anyway, let's get back on track now. Another use, and the one that's the subject of this article, is when Excel has been used as a database. Come on, you know what I'm talking about, with the first row containing the column headers followed by possibly thousands of data rows. The following screenshot contains an example, and is also the file that I will be using in this article. I took all records from the Production.Product table in the AdventureWorks 2008R2 database and dumped them in Excel. At some point people will realize, either because someone told them or because they lost some data due to inattentiveness, that it wasn't a really good idea to keep all that data in an Excel sheet. And they'll ask you to put it in a real database such as SQL Server. 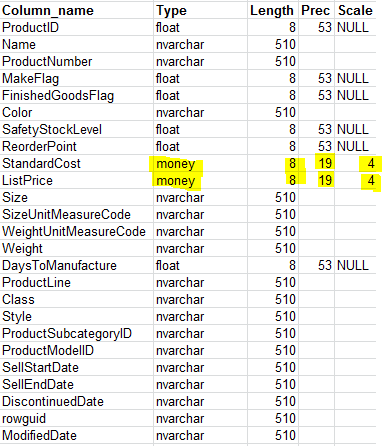 That's what I'm going to show you in the next paragraphs: how to import data from Excel into SQL Server. There are actually several different ways to achieve this. In this article I will use the OPENROWSET() function. This is a T-SQL function that can be used to access any OLE DB data source. All you need is the right OLE DB driver. The oldest version which I could confirm that contains this function is SQL Server 7.0, good enough to say that any version supports it. My sample Excel files are located in C:\temp\. This folder contains two files: Products.xls and Products.xlsx. The first file is saved in the old format, Excel 97-2003, while the second file was saved from Excel 2010. Both files contain the same data. The sheet containing the list of products is called ProductList. These queries are just returning the data from the Excel file into the Results window, when executed using the Management Studio. To insert the data into a table, uncomment the INTO clause. When uncommented, the statement retrieves the data from the Excel sheet and puts it into a newly-created local temporary table called #productlist. Furthermore, the query assumes that the first row contains the header. If that's not the case, replace HDR=YES with HDR=NO. Note: if you get an error message when running the query, look further down in this article. I've covered a couple of them. What Type Is Your Data? Because a temporary table is stored in the tempdb, the sp_help command should be issued against that database. As you can see, anything that looks like text will be put in a field of type nvarchar(510) and anything that looks like a number (integers, floating-point numbers, datetime values, ...) is put into a float(53). Not a lot of intelligence there. This is the result when no formatting was put on the cells in Excel. As an experiment I've changed the format of some fields in the Excel file and then retried the SELECT INTO statement. What did I change? I identified ProductID as being a number without any decimals, changed StandardCost and ListPrice to a currency with four decimal digits and I changed SellStartDate and SellEndDate to a custom date/time format showing both date and time. 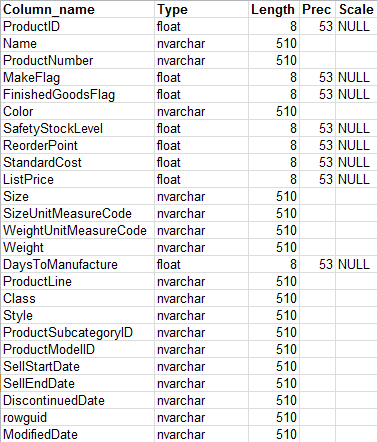 ProductID is still being stored into a float field, even though in Excel it's defined as having no decimals. And the datetime values are not recognized either. Okay, I used a custom format there, so maybe it's due to that. It's up to you of course how you use this method of importing the data. You can put your records into a temporary table to process further, or you can create a table with the expected data types upfront and import the data directly into that one. Let's cover some issues related to this method. To get a good look at all the different settings, just run the sp_configure procedure without any parameters. Note: if you're not the administrator of the server, you should talk to the DBA who's responsible before attempting this. The OLE DB provider "Microsoft.Jet.OLEDB.4.0" for linked server "(null)" reported an error. The provider did not give any information about the error. 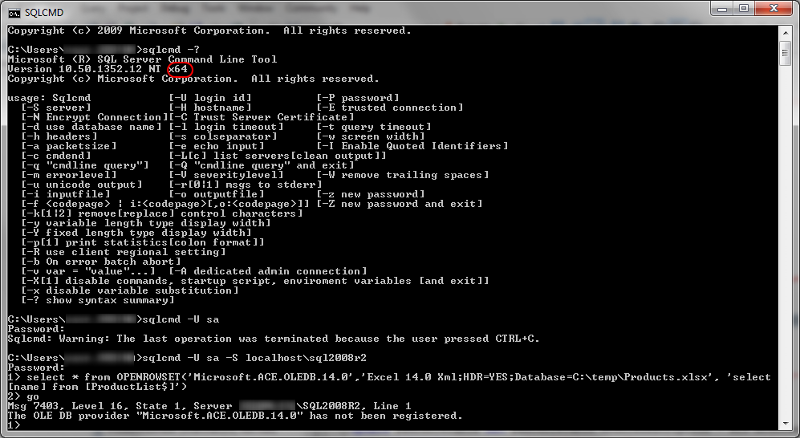 Cannot initialize the data source object of OLE DB provider "Microsoft.Jet.OLEDB.4.0" for linked server "(null)". So close the file and try the query again. The OPENROWSET() function uses OLE DB, so it needs a driver for your data source, in this case for Excel. If the right driver is not installed, you'll see the following error (or similar, depends on the version used). To solve the issue, install the right driver and try again. How can you tell what drivers are installed? Open up the ODBC Data Source Administrator window (Start > Run > type ODBCAD32.EXE and enter) and have a look in the Drivers tab. The following screenshot (taken on a Dutch Windows XP) shows both the JET 4.0 driver for Excel 97-2003 and the fairly-new ACE driver for Excel 2007. Sidenote: the Excel 2010 driver is not supported on Windows XP, but I was able to query the 2010 Excel sheet using the 2007 driver. 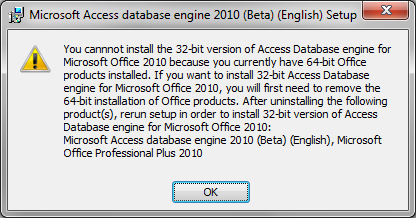 I guess that this is the result of the Office Open XML standard which was introduced in Office 2007. In other words, you won't be needing that first link for the Jet driver. For the full story have a look at this blog post by Adam Saxton of the CSS SQL Server Escalation Services team. The OLE DB provider "Microsoft.ACE.OLEDB.14.0" has not been registered. The Results pane shows all the columns with the right column names, retrieved from Excel. But the driver seems to have a problem retrieving the actual data. This issue with error 7330 is mentioned in the following thread on the SQL Server MSDN forum, but unfortunately the proposed solution didn't solve the problem in my case. I also tried using the 64-bit version of sqlcmd.exe, but strangely enough that throws the same error. It's exactly the same query, only difference is the comment line at the start. And even weirder, if I add a space after the double-dash, the query works fine as well! Then I decided to remove the commented INTO clause. This made the weird behavior disappear. So for some reason SQL Server doesn't like the OPENROWSET function combined with comments inside the query. The strange behavior also disappears when a space is added between the double-dash and the INTO keyword. If anyone has got an explanation on this strange behavior: please do post a comment! For now my conclusion is: don't use comments when creating an OPENROWSET query. The above has shown that OPENROWSET() can be a useful function, given the right circumstances. But in the wrong setting it can be quite cumbersome to get to work. I would recommend this method only for one-off quick imports, such as when you as a developer are given a bunch of data in a spreadsheet and need to get it into the database, one way or another. I would not use it for an automated import process. For that we've got a more interesting alternative which I'll cover in an upcoming article. CSS SQL Server Engineers: How to get a x64 version of Jet?